CK Special Gases are the official UK distributor for Matheson Tri Gas. Matheson offer a wide range of very high quality and reliable flowmeters for use with gases and liquids. We keep a large stock of Matheson products including selected spare parts. Our favorite is the FM 1050 Model, this is because it is so versatile. We can supply it for any gas or gas mixture from stock, it’s very well made and extremely reliable. functionally and dimensionally interchangeable with other current designs while incorporating many innovative features. 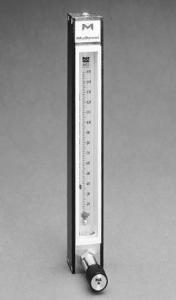 All FM-1050 Series glass metering tubes have integral float guides to ensure a guaranteed ±5% (±1% with optional calibration) of full scale accuracy. Both glass and stainless steel floats are included. The meters are available in a range of 150mm reference indicating scales. Be sure to request calibration data for the gas(es) you will be measuring. Standard with this series is the uniquely designed Tube-Cube®. The “cube,” a unitized tube holder, aligns the tube quickly and easily for simple tube installation or replacement. The Tube-Cube® provides protection during handling, reducing chipped tube ends, broken tubes and misalignment. The 1.5 X scale magnification lens allows for a more accurate reading. End seals in the FM-1050 are direct acting and non rotating for fast alignment and convenient service access.